1. Define Complementary and Integrative Health, and how it may enhance occupational therapy practice. 2. Describe the benefits of 5 Complementary and Integrative Health approaches. 3. 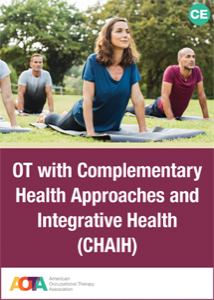 Describe 3 ways to document OT interventions that include Complementary and Integrative Health.